Chris Lee, the chief executive officer of OKEx, has recently left the company. His resignation comes as a surprise, especially since OKEx has been expanding internationally and has also become the largest cryptocurrency exchange by reported turnover. According to Bloomberg, in an emailed statement on Monday, Lee’s decision to leave the company was personal as he wanted to “start a new life.” In a separate statement, a spokeswoman for Lee also mentioned that he found it “the greatest pleasure and an honour” to work at OKEx. After a short break with his family, he will return to the blockchain and cryptocurrency community. Lee’s image and biography were removed from the OKEx website. The company has not yet made any new announcements as to who Lee’s replacement will be. While OKex was reported to be the largest cryptocurrency exchange by reported turnover, with more than $2 billion of cryptocurrency trades in the past 24 hours, there’s also been a suspicion that the cryptocurrency exchange is inflating their volumes. Despite surpassing Binance to become the most active cryptocurrency exchange in the world, the online cryptocurrency community remains skeptical of their numbers. Last month in April 2018, OKEx announced that it would be expanding to the Mediterranean island nation, Malta. The move is not much of a surprise considering Malta has invested in blockchain friendly regulations and legislation. Cryptocurrency exchange Binance has also moved its team and resources to Malta. OKEx is currently based out of Hong Kong, which is well-known for its business-friendly environment. However, in February 2018, Hong Kong has taken a stricter and harsher approach towards cryptocurrencies and ICOs. On the other hand, Malta is very cryptocurrency friendly. Government officials have also mentioned that their goal is to transform Malta into a blockchain island through friendly legislation. “We look forward to working with the Malta government as it is forward thinking and shares many of our same values: the most important of which are protection of traders and the general public compliance with Anti-money laundering and Know Your Customer standards, and recognition of the innovation and importance of continued development in the blockchain ecosystem,” said Chris Lee, the previous CEO of OKEx. In the last 24 hours, according to CoinMarketCap, OKEx handled $2.1 billion in cryptocurrency trades, while Binance processed $1.9 billion in volume. 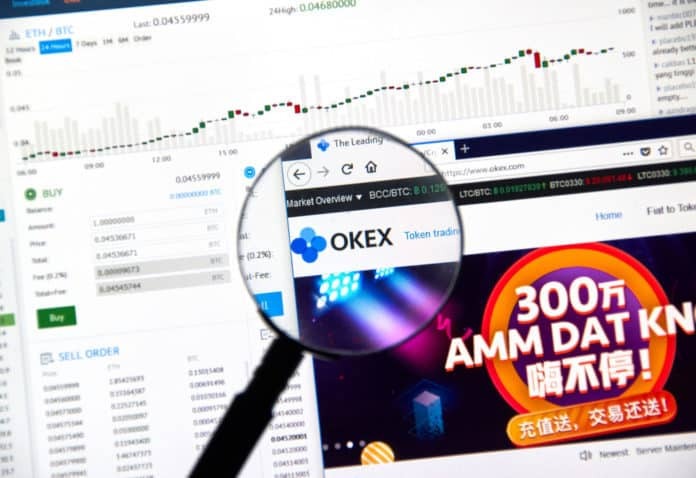 The cryptocurrency community is however skeptical of the numbers considering OKEx’s parent operator OKcoin was previously involved in a contract violation scandal that resulted in potentially inflating or falsifying trading volume. Furthermore, Sylvain Ribes, a popular cryptocurrency trader, and investor also released a report in March 2018 which detailed his study on trading volume and why he believes OKEx’s trading volume is mostly inflated. The report gained almost 17,000 claps on Medium with over 60 comments raising concerns over fake volumes of cryptocurrency exchanges. While it’s unclear whether the trade volume is genuine or inflated, Twitter user @AlistairMilne even questioned whether OKEx is “back to their old tricks?” OKEx has however not yet responded to any allegations on Twitter.